I’m happy to release Dunkard Bottom, the sequel to Permelia Lyttle’s Guide to the End of the World. Writing book-length fiction always takes longer than one thinks, and you never feel like it’s finished. However, at some point one has to make way for new thinking, new themes, and new characters. I appreciate the scattered souls who encouraged me to write these books, and as I move on to a new story obsession, I leave Luray and Abigail Flitch (and Jason, left) to fend for themselves. If you think the end of the world is scary, wait until Luray takes charge. Luray Flitch is a neurotic, pill-popping recluse who discovers a prophetic Victorian diary, only to learn that the end of the world is just around the corner. With his trusty dog, Jason, Luray ventures out to warn the world that the end is near. But why do people keep trying to steal the diary? The diary, written a century before by British clairvoyant Permelia Lyttle, hides many other secrets: a murder mystery and Permelia’s strange life in the Women’s Lunatic Asylum, where she was forced to give psychic readings to the power elite of her day. Prophecies unite in this satirical novel of eccentric villains, top-level conspiracies, the Apocalypse, and one really terrific dog. Follow Luray’s intellectual low-speed chase, inept gun play, and search for the meaning of life while doing the naked tango with the sweet but quirky Abigail Lind at her secret mountain hideaway. Permelia Lyttle’s Guide is available from Amazon.com. Sure, the end of the world came. But it wasn’t anything like Luray and Abigail imagined. In this sequel to Permelia Lyttle’s Guide to the End of the World, Luray’s wife Abigail believes the end is just around the corner. So, the resourceful heiress buys and restores an abandoned village where she hopes to create an idyllic community for surviving in style. However, the apocalypse turns out to be nothing like anyone imagined. In Dunkard Bottom, humankind’s ultimate swan dive takes on new meaning as prophecies converge and dangers loom. Despite its bickering citizens, the village grows. But the community is soon simmering with romances, rivalries, distrust, and evidence of a traitor in their midst. Will Luray lose Abigail under the strain? Is Jason who he says he is? And whatever happened to Permelia Lyttle’s daughter? 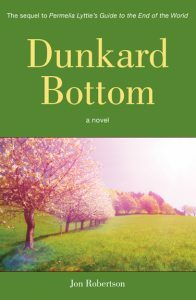 With the digital age fizzled and the government a no-show, Dunkard Bottom is American ingenuity at its quirky best under the threat of white-collar terrorists, illness, death, and weeds. Dunkard Bottom is available from Amazon.com.